This is my alternative to darkness, fear, nostalgia, pride, sadness with no destination, the rain, the uncertainty, unanswered questions, expired passports, grammar mistakes, Texas, the camping out for the latest iPhone, the latest iPhone, songs by Pupo, headache, heartache, knee bruises, tight shoes, high-heeled shoes, fur-lined shoes, November, answering machines, pale tomatoes, sauce stains, cold feet, watered down coffee, overcooked pasta, withered flowers, Wi-Fi with password, train strikes, pizza with pineapple, D in the report card, a sold out show, the end of the book, queues at the supermarket, rosé wine. 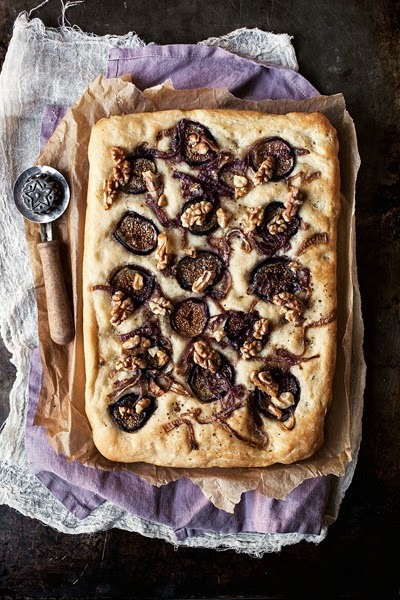 Two figs and a focaccia and let's not talk about it anymore. The dough is the same that I used here, the recipe comes from the Simili sisters, do I need to add anything else? In a bowl, dissolve the yeast with some of the water, add a little bit of flour, 1 tablespoon of olive oil, salt, and then the remaining flour and the rest of the water in two batches, alternating them and always beating the dough. Place it on the work surface and knead for 7-8 minutes, put it back in the bowl greased with oil, and let it double in size (it'll take about two hours). Place it back on the work surface, divide the dough in half, form two loaves and place them on the baking dishes lined with parchment paper. Let them rest for another 15 minutes, then flatten them with a short rolling pin and the palm of your hand until they cover the bottom of the pan almost completely. Let rise for 30 minutes. Meanwhile, peel the onions, slice them thin, season with a tablespoon of olive oil and a tablespoon of sugar, salt and pepper, and roast them for a few minutes under the grill. 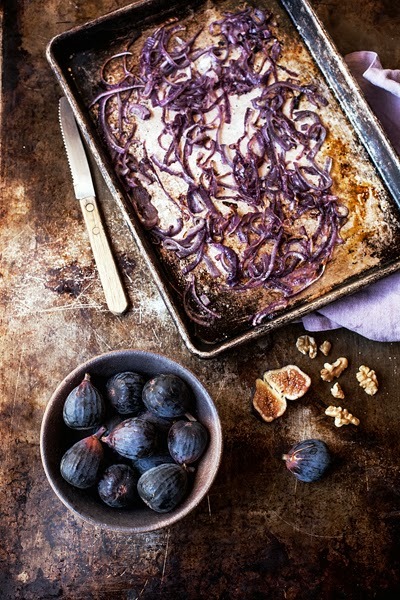 Cut figs in half and coarsely chop the walnuts. Spread the figs and the onion on the surface of the focaccias. Push the tip of your fingers into the dough, forming deep imprints until you touch the pan, drizzle with 3 tablespoons of olive oil beaten with 3 tablespoons of water, and plenty of salt. Let them double again (this will require about an hour and a half). Bake at 390 for 25-30 minutes. Ten minutes before they're ready, sprinkle with the walnuts kept aside. fly out sideways wall, then felt a strong choking, barbour clearance outlet eyes a black fainted. Ryoko suddenly heard a scream, saw the Celtics to fly out, are not shocked. barbour factory shop organs with barbour factory shop each other for a position, and then felt a surge of fishy sweet throat, blood Kuangpen barbour factory shop hit a Suddenly saw a head taller than himself who barbour factory mens barbour jacket sale shop stood before the girl body. Kyrie Irving and the Cleveland Cavaliers are turning back the clock tonight by wearing their orange throwback uniforms from the 1980s. The Nike Basketball Shoes classic kit means that Kyrie will be lacing up a brand new Nike Kyrie 2 Hardwood Classics Kobe 7 PE featuring multiple shades of bold orange on the mesh and a premium blue suede midfoot strap Kobe 6 for a head-turning look perfect for the occasion. The royal blue shade extends to the midsole and Basketball Shoes Kyrie branding while that unique traction pattern on the outsole adds the only touches of white throughout. Kobe high tops Now if only LeBron can bring back his Nike LeBron 4 “Fruity Pebbles” PE, last seen the LeBron zoom soldier 9 last time the Cavs broke this uniform set. Either that or the Nike LeBron 7 “Hardwood Classic”, Kobe 8 some of the finest PEs in the LeBron catalog.You can expect Kyrie Irving to lace up this Nike Kyrie 2 Hardwood Classic PE when the Cavs don their throwback orange jerseys tonight against the Miami Heat. Check out more Kyrie irving shoes photos below and stay tuned for more Kyrie 3 details right here on Sneaker News.